Zeno the Isaurian (/ˈziːnoʊ/; Latin: Flavius Zeno Augustus; Greek: Ζήνων; c. 425 – 9 April 491), originally named Tarasis Kodisa Rousombladadiotes /ˈtærəsᵻs/, was Eastern Roman Emperor from 474 to 475 and again from 476 to 491. Domestic revolts and religious dissension plagued his reign, which nevertheless succeeded to some extent in foreign issues. His reign saw the end of the Western Roman Empire under Romulus Augustus, but he contributed much to stabilizing the eastern Empire. Zeno's original name was Tarasis, and more accurately Tarasikodissa in his native Isaurian language (Latin: Trascalissaeus). Tarasis was born in Isauria, at Rusumblada, later renamed Zenonopolis in Zeno's honour. His father was called Kodisa (as attested by his patronimic "Tarasicodissa"), his mother Lallis, his brother Longinus. Tarasis had a wife, Arcadia, whose name indicates a relationship with the Constantinopolitan aristocracy, and whose statue was erected near the Baths of Arcadius, along the steps that led to Topoi. Near Eastern and other Christian traditions maintain that Zeno had two daughters, Hilaria and Theopiste, who followed a religious life, but historical sources attest the existence of only one son by Arcadia, called Zenon. According to ancient sources, Zeno's, who had fought against Attila in 447 to defend Constantinople and had been consul the following year, prestigious career was the reason why another Isaurian officer, Tarasis, chose the Greek name Zeno when he married into the Imperial family, thus being known as Zeno, when he rose to the throne. Some modern historians suggest that the Isaurian general Zeno was the father of the emperor, but there is no consensus about this, and other sources suggest that Tarasis was member of Zeno's entourage. According to some scholars, in the mid-460s, Eastern Roman Emperor Leo I wanted to balance the weight of the Germanic component of the army, whose leader was the Alan magister militum Aspar. He thought that Tarasis and his Isaurians could be that counterweight, and called him, with many Isaurians, to Constantinople. This interpretation, however, has been contested. By mid-460s, Arcadia and Zeno had been living at Constantinople for some time, where also Lallis and Longinus lived, the latter married to a Valeria, possibly a woman of aristocrat rank. According to ancient sources, the earliest reference to Tarasis dates back to 464, when he put his hands on some letters written by Aspar's son, Ardabur, which proved that the son of the magister militum had incited the Sassanid King to invade Roman territory, promising to support the invasion. Through these letters, which Tarasis gave to Leo, the Emperor could dismiss Ardabur, who at the time was magister militum per Orientem and patricius, thus reducing Aspar's influence and ambition. As reward for his loyalty, which Leo praised with Daniel the Stylite, Tarasis was appointed comes domesticorum, an office of great influence and prestige. This appointment could mean that Tarasis had been a protector domesticus, either at Leo's court in Constantinople, or attached at Ardabur's staff in Antioch. In 465, Leo and Aspar quarreled about the appointment of consuls for the following year; it was on this occasion that Tarasis' position was strengthened, as he became friend and ally of the Emperor. To make himself more acceptable to the Roman hierarchy and the population of Constantinople, Tarasis adopted the Greek name of Zeno and used it for the rest of his life. In mid-late 466, Zeno married Ariadne, elder daughter of Leo I and Verina; as there is no reference to a divorce with Arcadia, she should have died in those years. The next year their son was born, and Zeno became father of the heir apparent to the throne, as the only son of Leo I's had died in his infancy; to stress his claim to the throne, the boy was called Leo. Zeno, however, was not present at the birth of his son, as in 467, he participated in a military campaign against the Goths. Zeno, as member of the protectores domestici, did not take part in the disastrous expedition against the Vandals, led in 468 by Leo's brother-in-law Basiliscus. The following year, during which he held the honour of the consulate, he was appointed magister militum per Thracias and led an expedition in Thrace. The sources do not clearly state what enemy he fought there, and historians had proposed either Goths or Huns, or the rebels of Anagastes. Either way, before leaving, Leo and Zeno asked for Daniel the Stylite's opinion about the campaign, and Daniel answered that Zeno would have been the target of a conspiracy but would have escaped unharmed. What happened was that Leo sent some of his personal soldiers with Zeno to protect him, but they were bribed by Aspar to actually capture him. Zeno was informed of their intention and fled to Serdica, and because of this episode, Leo grew even more suspicious of Aspar. After the attack, Zeno did not return to Constantinople, where Aspar and Ardabur were and had still considerable power. Instead, he moved to the "Long Wall" (the Long Wall of the Thracian Chersonese or, less probably, the Anastasian Wall), then to Pylai and from there to Chalcedon. While waiting here for an opportunity to return in the capital, he was appointed magister militum per Orientem. He took the monk Peter the Fuller with him and left for Antioch, his office's see, passing through Isauria, where he put down the rebellion of Indacus. Zeno stayed at Antioch for two years. While living in Antioch with his family, Zeno sympathised with the Monophysite views of Peter the Fuller, and supported him against his opponent, the Chalcedonian bishop Martyrius. Zeno allowed the arrival in Antioch from nearby monasteries of monks who increased the number of Peter's followers, and did not repress effectively their violence. Martyrius went to Constantinople, to ask Leo for help, but returning to Antioch he was informed that Peter had been elected bishop and resigned (470). Leo reacted ordering the exile for Peter and addressing to Zeno a law that forbade the monks to leave their monasteries and to promote rebellion (1 June 471). In 470/471, Zeno had also to deal with an invasion of Tzanni, who attacked Roman Armenia. With Zeno far from Constantinople, Aspar had increased his influence by having his son Patricius appointed Caesar and married to Leo I's younger daughter, Leontia (470). Sources are contradictory on the causes, but clearly state that in 471, Leo I had Aspar and Ardabur treacherously killed, certainly with Zeno's and Basiliscus' approval, as in the eve of the murders, the two generals had moved closer to Constantinople (Zeno was at Chalcedon). After their death, Zeno returned to Constantinople and was appointed magister militum praesentalis. Zeno had to settle the matters with the Vandals of King Genseric, who threatened the sea commercial routes with their incursions on the coastal cities of the Empire. Zeno sent Genseric a high-ranking officer as ambassador, Severus, who succeeded in stipulating an "eternal" peace between the Vandals and the Eastern Roman Empire, a peace which allowed the Romans to pay ransoms for the prisoners in Vandal hands and which ended the Vandal persecution of Orthodox Christians in the Vandal territory. Despite this success, Zeno continued to be unpopular with the people and Senate because of his barbarian origins; his right to the throne was limited to his marriage with Ariadne and his relationship to Verina, the dowager Empress. Therefore, he chose to support himself on the Isaurian component of the army, in particular to strengthen his bond with the Isaurian generals and brothers Illus and Trocundes. However, Verina decided to overthrow her son-in-law Zeno and replace him with her lover, the ex-magister officiorum Patricius, with the help of her brother Basiliscus. The conspirators caused riots in the capital against the Isaurian emperor; Basiliscus succeeded also in convincing Illus, Trocundes and the Ostrogothic general Theodoric Strabo to join the plot. Coin of Basiliscus, who revolted against Zeno in January 475 and held the power until Zeno's return in August 476. Basiliscus was Verina's brother; he took the power after having Zeno flee from Constantinople, but alienated the support of the people of Constantinople and was captured and put to death by Zeno. However, the conspirators quickly fell in conflict with each other. Basiliscus took the throne for himself, putting to death Verina's lover and candidate, Patricius. He also allowed the mob to kill all of the Isaurians left in Constantinople, an episode that damaged his bond to the Isaurian generals Illus and Trocundes. Basiliscus appointed his nephew Armatus magister militum, thus alienating Theodoric Strabo. Since Zeno had left no money, Basiliscus was forced to levy heavy taxes. Finally, he alienated the Church, supporting the Monophysites. The people of Constantinople also put the blame on him for a great fire that burned several parts of the city. With the secret support of the Senate, and with the help of bribes paid by Zeno, Illus accepted to switch sides and united his army with Zeno's, marching on Constantinople. Basiliscus tried to recover popular support and sent another army against Zeno, under his nephew Armatus' command. Zeno succeeded in bribing Armatus too, promising to confirm his rank of magister militum praesentalis for life and promoting his son (also called Basiliscus) to the rank of Caesar; Armatus' army did not intercept Zeno's troops marching on Constantinople, and the lack of Theodoric Strabo and his army decided the fate of Basiliscus, who fled with his family to the church of Hagia Sophia. In 477, however, Zeno changed his mind, probably by instigation of Illus who would have gained by the fall of Armatus, and ordered Armatus' death. Zeno confiscated all of the properties of Armatus, deposed his son Basiliscus, and had him ordained as a priest. The western emperor Olybrius died in the autumn of 472. Gundobad, the western magister militum then proclaimed Glycerius, the comes domesticorum (commander of the Imperial guard) as western emperor in Ravenna. The eastern emperor Leo I refused to endorse Glycerius and elevated his nephew Julius Nepos to co-emperor for the west in 473. Expecting resistance, Nepos was forced by bad winter weather to delay his voyage until the next year; it was therefore left to Zeno, as Leo's successor, to support Julius Nepos' installation in Ravenna. Nepos arrived in Italy, quickly deposed Glycerius who offered no resistance, and was proclaimed Emperor by the Roman Senate in June 474. 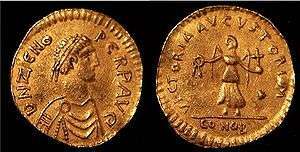 Julius was on good terms with Zeno, and he even minted coins in the names of Zeno, Leo II and himself. On August 475, during Basiliscus' reign, while Zeno was in Isauria blocked by Illus' army, Orestes, the western magister militum, revolted, forcing Nepos to flee Italy for Dalmatia; Orestes proclaimed his own son, Romulus Augustus, but was unable to gain the allegiance of the remnants of the Western Empire outside of Italy. One year later, while Zeno was entering Constantinople to end Basiliscus' brief usurpation, Romulus and Orestes were overthrown by the Chieftain Odoacer. With the support of Odoacer, the Roman Senate sent an envoy to present the imperial insignia to the restored Zeno. 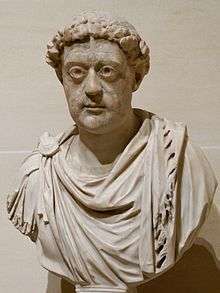 They asked Zeno to dissolve the separation of the empire and rule as sole Emperor; also, to appoint Odoacer both patricius and official imperial governor of Italy. At the same time, Zeno received another embassy, sent by Julius Nepos, who asked Zeno to give him the money and the army he needed to resume his control of Italy. Zeno answered that the Roman Senate should welcome back Julius Nepos, their rightful Emperor, and that Odoacer should properly receive the patriciate from Nepos, although he allowed that he would also grant it. Odoacer was officially recognized and left in possession of Italy, while Nepos kept his title and the other fragments of the empire's western holdings, but no army. Perhaps in deference to Zeno, Odoacer recognized Nepos' de jure reign in Italy until his death, ruling and even minting coins in his name, but he never allowed his return. After Nepos' assassination in 480, Odoacer invaded Dalmatia to pursue and punish the assassins (and also to take Dalmatia for himself). Zeno legitimized Odoacer's authority in Dalmatia; Odoacer recognized Zeno as sole Emperor of the again unitary Empire, but increasingly started using the title Rex ("King") for himself. In 479 Marcian tried to overthrow Zeno and reclaim the throne for himself. With the help of his brothers Procopius Anthemius and Romulus, he gathered in Constantinople troops composed of both citizens and foreigners in the house of a Caesarius, south of the Forum of Theodosius, and from there they marched at the same time on the imperial palace and on the house of Illus, who was a supporter of Zeno. The emperor almost fell in the hands of the rebels, who, during the day, overwhelmed the imperial troops, who were hit also by the citizens from the roofs of their houses. During the night, however, Illus succeeded in moving inside Constantinople an Isaurian unit whose quarters were in the nearby Chalcedonia and in corrupting Marcian's soldiers, who allowed Zeno to flee. On the following morning Marcian, understanding that his situation was desperate and that the reinforcements of the Gothic general Theodoric Strabo would not arrive in time, took refuge in the church of the Holy Apostles, but was arrested with his brothers. The commanding position and popular favour of Illus rendered him an object of suspicion, and Zeno in various ways sought to rid himself of him. Also Verina, the dowager Empress, was his enemy, and formed a plot against his life. Verina's attempt was defeated, and Zeno, equally jealous of her and of Illus, banished her at the instance of the latter, and confined her in the fort of Papurius. There is some doubt as to the time of these events also. Candidus places the banishment of Verina before the revolt of Marcian, and Theodore Lector assigns as the cause of it her share in the revolt of Basiliscus. 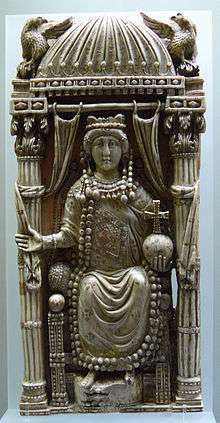 It is not unlikely, indeed, that this turbulent woman was twice banished, once before Marcian's revolt, for her connection with Basiliscus, and again after Marcian's revolt, for her plot against Illus. From her prison she managed to interest her daughter Ariadne, the wife of Zeno, in her favour, and Ariadne endeavoured to obtain her release, first from Zeno, and then from Illus, to whom the Emperor referred her. Illus refused her request. Ariadne, like her mother, attempted to assassinate Illus. Jordanes ascribes her hatred to another cause: he says that Illus had infused jealous suspicions into Zeno's mind which had led Zeno to attempt to end her life, and that her knowledge of these things stimulated her to revenge. The assassin whom she employed only wounded Illus; he was taken prisoner and Zeno, who appears to have been privy to the affair, was unable to prevent his execution. Illus — with his friend Pamprepius, Leontius and his brother Trocundus — now retired from court. They first went to Nicaea and then, on pretence of change of air and of procuring a cure for his wound sustained during the attempt on his life, into the East where he was made magister militum. Having traversed Asia Minor they raised the standard of revolt in 484, when Illus declared Leontius as Emperor. Zeno sent an army to fight them, but Illus won, obtained possession of Papurius, released Verina, and induced her to crown Leontius at Tarsus. In 485 Zeno sent against the rebels a fresh army, said to consist of Macedonians and Scythians (Tillemont conjectures, not unreasonably, that these were Ostrogoths) under John the Hunchback, or, more probably, John the Scythian, and Theoderic the Amal, who was at this time consul. John defeated the rebels near Seleucia and drove them into the fort of Papurius where he blockaded them. After few months Trocundus died; the fort was taken only after four years of siege, by the treachery of Trocondus's brother-in-law, who had been sent for the purpose from Constantinople by Zeno, and Illus and Leontius were beheaded (488) and their heads sent to the Emperor. 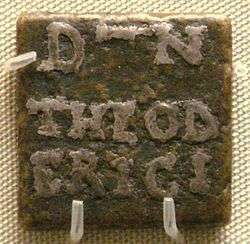 Bronze weight with the name of Theoderic the Great, King of the Ostrogoths and ruler of Italy. Theoderic served under Zeno, fighting against his opponent Theodoric Strabo (476–481), and then was the leader of the army that besieged the fort of Papurius and captured and killed Illus' brother, Trocondus (484). At the death of Leo II (January 474) Theodoric Strabo rebelled against Zeno. His support was fundamental for the overthrowing of Zeno and the rise of Basiliscus to the Byzantine throne (475), but Theodoric was very upset by Basiliscus, so when Zeno returned to Constantinople in 476 and defeated Basiliscus, Strabo was reported to have not defended the city. In 476/477, Zeno allied himself with Strabo's rival, Theoderic the Amal, and ordered him to attack Strabo. The leader of the Thracian Goths sent an embassy to the Emperor, offering peace and blaming the Moesian Theodoric. Zeno understood that this offering was hiding further conspiracies, and convinced the Constantinople Senate and army to declare Strabo a public enemy. Zeno tried to divide the two Theoderics, bribing the Amal, who refused. The Imperial army obtained some initial successes, however Zeno did not capitalize upon his victory, and allowed the Amal to move westward in Thrace, plundering the territories as he went. With the Amal far away, Strabo accepted an agreement with Zeno: Strabo was to be given back his wealth, money to pay 13,000 soldiers, the command of two palatinae units, and the title once more of magister militum. However, the army of Theodoric Strabo, 30,000-men strong was still a menace for Zeno, who convinced the Bulgars to attack the Thracian Goths in their own base. Strabo defeated the Bulgars in 480/481, and moved towards Constantinople, but he had to deal with problems with his own men, so he could not capitalize upon his victory and was forced to return to Greece. On his way back, he died in an accident. After Theodoric Strabo died in 481, the future Theoderic the Great became king of the entire Ostrogoth nation and began to be a source of trouble in the Balkan peninsula. Zeno allied to Theoderic, whom he appointed magister militum praesentalis and even consul for the year 484, the first time a barbarian who was not a citizen of the Empire reached such a high distinction. Zeno had Theoderic fight against Illus and the usurper Leontius, besieging them at Papurius in 484–488. However, in 486 Theoderic revolted again and attacked Constantinople, severing the city's water supply. Zeno bought a peace and agreed with Theoderic that the Ostrogoths should have gone to invade Italy and fight Odoacer, who had allegedly supported Leontius, and to establish his new kingdom there (487). This all but eliminated the Germanic presence in the east. In religious matters, Zeno is famous for his Henotikon, "Act of Union", issued in 482 to mediate between Chalcedonian and Miaphysite opposing views about the nature of Christ. The Chalcedonians recognised two natures (physis) in Christ, the Miaphysites only one; the Council of Chalcedon (451) had issued the Chalcedonian Creed and condemned the Miaphysite position, but the Miaphysites were still strong, especially in the Eastern provinces of the Empire, and the Patriarch of Alexandria, Peter Mongus, was a Miaphysite. Supporting the Miaphysites was one of the mistakes made by Basiliscus, as the people of Constantinople were Chalcedonian, but Zeno needed the support of the Miaphysite provinces, Egypt, Syria, Palestine and Asia Minor; also the Patriarch of Constantinople, Acacius, was interested in reducing the distance between the two positions. Therefore, in 482 he issued the Henotikon, a document he had elaborated with the support of Acacius and addressed to the factions in Egypt. The edict affirmed the Nicene-Constantinopolitan Creed (i.e. the Creed of Nicaea completed at Constantinople) as affording a common, final and united symbol or expression of faith. All other symbola or mathemata were excluded; Eutyches and Nestorius were unmistakably condemned in an anathema, while the twelve chapters of Cyril of Alexandria were accepted. The teaching of Chalcedon was not so much repudiated as passed over in silence; Jesus Christ was described as the "only-begotten Son of God [...] one and not two" and there was no explicit reference to the two natures. In 488 the patriarch of Antioch, Peter the Fuller came to Constantinople to have his right on the Church of Cyprus confirmed. Zeno called the bishop of Cyprus, Anthemius, to answer the accusations. The bishop claimed that before his departure, he had had a vision of St. Barnabas, in which the position of the tomb of the apostle had been revealed to him. In the tomb, Anthemius had found the relics of the apostle and a copy of the Gospel of Matthew written in Hebrew by Barnabas himself. Zeno received the relics and the manuscript, and in exchange he proclaimed the autonomy of the Church of Cyprus. In 489 Zeno closed the Persian school of Edessa, Mesopotamia, by request of bishop Cyrus II of Edessa, because it promoted Nestorian teachings, and built a church in its place. The school relocated to its original home of Nisibis, becoming again the School of Nisibis, leading to a wave of Nestorian immigration into Persia. According to Samaritan sources, Zeno (whom the sources call "Zait the King of Edom") persecuted the Samaritans. The Emperor went to Sichem (Neapolis), gathered the elders and asked them to convert; when they refused, Zeno had many Samaritans killed, and re-built the synagogue to a church. Zeno then took for himself Mount Gerizim, where the Samaritans worshipped God, and built several edifices, among whom a tomb for his recently deceased son, on which he put a cross, so that the Samaritans, worshipping God, would prostrate in front of the tomb. According to these same sources, Zeno was buried on Mount Gerizim. Later, in 484, the Samaritans revolted. The rebels attacked Sichem, burnt five churches built on Samaritan holy places and cut the fingers of bishop Terebinthus, who was officiating the ceremony of Whitsun. They elected a Justa (or Justasa/Justasus) as their king and moved to Caesarea, where a noteworthy Samaritan community lived. Here several Christians were killed and the church of St. Sebastian was destroyed. Justa celebrated the victory with games in the circus. According to John Malalas, the dux Palestinae Asclepiades, whose troops were reinforced by the Caesarea-based Arcadiani of Rheges, defeated Justa, killed him and sent his head to Zeno. According to Procopius of Caesarea, Terebinthus went to Zeno to ask for revenge; the Emperor personally went to Samaria to quell the rebellion. According to a popular legend recorded by two ancient historians, Zeno was buried alive after becoming insensible out of drinking or of an illness; he called for help, but Ariadne did not allow anyone to open the sarcophagus. Zeno was a player of τάβλη (tabula), a game nearly identical to modern backgammon. (Τάβλη is still used to refer to backgammon in Greece.) In 480 he had a hand that was so unlucky that he wrote an epigram to record it; Agathias reproduced it half a century later and this allowed the game to be reconstructed in the 19th century. Zeno, who was white, had a stack of seven checkers, three stacks of two checkers and two blots, checkers that stand alone on a point and are therefore in danger of being put outside the board by an incoming opponent checker. Zeno threw the three dice with which the game was played and obtained 2, 5 and 6. As in backgammon Zeno could not move to a space occupied by two opponent (black) pieces. The white and black checkers were so distributed on the points that the only way to use all of the three results, as required by the game rules, was to break the three stacks of two checkers into blots, thus exposing them to capture and ruining the game for Zeno. Zeno is the protagonist of a theatrical drama in Latin Zeno, composed circa 1641 by the Jesuit play-writer Joseph Simons and performed in 1643 in Rome at the Jesuit's English College. On this Latin Zeno a Greek anonymous drama is modelled, belonging to the so-called Cretan Theatre. This version was written and performed at Zakynthos in 1682–1683 and has Zeno buried alive and his brother Longinus executed. 1 2 The sources call him "Tarasicodissa Rousombladadiotes", and for this reason it was thought his name was Tarasicodissa. However, it has been demonstrated that this name actually means "Tarasis, son of Kodisa, [coming from] Rusumblada", and that "Tarasis" was a common name in Isauria (R.M. Harrison, "The Emperor Zeno's Real Name", Byzantinische Zeitschrift 74 (1981) 27–28). 1 2 Stephen Mitchell, A history of the later Roman Empire, AD 284–641: the transformation of the ancient world, Wiley-Blackwell, 2007, ISBN 1-4051-0856-8, p. 114. 1 2 3 Croke, pp. 160–161. ↑ Terry G. Wilfong, Women of Jeme: lives in a Coptic town in late antique Egypt, University of Michigan Press, 2002, ISBN 0-472-06612-9, p. 35. 1 2 Martindale, "Zenon 4", p. 1198. ↑ Jordanes, 333; Evagrius, ii.15. ↑ Stephen Mitchell, A history of the later Roman Empire, AD 284-641: the transformation of the ancient world, Wiley-Blackwell, 2007, ISBN 1-4051-0857-6, pp. 114-115. 1 2 3 4 Croke, pp. 166–168. ↑ Life of Daniel the Stylite, 55, cited in Croke, p. 168. ↑ The source is Photius's epitome of the first book of Candidus' chronicle (Croke, p. 161). ↑ The law is contained in the Justinian Code (1.3.29). 1 2 3 4 Williams and Friell, pp. 181–183. ↑ Elton, Hugh (10 June 1998). "Flavius Basiliscus (AD 475–476)". De Imperatoribus Romanis. Retrieved 23 August 2006. ↑ There exist some solidi and tremisses in the name of "Zeno and Leo nob[ilissimus] caes[ar]". They have been attributed to Zeno as emperor and to Armatus' son as Caesar; in this case Armatus' son would have changed his name from Basiliscus, the name of the usurper, to Leo, the dynastic name of Zeno's house (Philip Grierson, Melinda Mays, Catalogue of late Roman coins in the Dumbarton Oaks Collection and in the Whittemore Collection: from Arcadius and Honorius to the accession of Anastasius, Dumbarton Oaks, 1992, ISBN 0-88402-193-9, pp. 181–182). ↑ Evagrius Scholasticus, Historia Ecclesiae, 3.xxiv. Evagrius reports that Basiliscus, the son of Armatus, later became bishop of Cyzicus. 1 2 Martindale, J.R. (1980). The Prosopography of the Later Roman Empire. Cambridge University Press. pp. pp. 148–149. ISBN 0-521-20159-4. ↑ Malchus, fragment 10, cited in Ralph W. Mathisen, "Romulus Augustulus (475–476 A.D.)--Two Views", De Imperatoribus Romanis. ↑ Williams and Friell, p. 187. 1 2 John Bagnall Bury, "X.2 The Revolts of Marcian and Illus (A.D. 479‑488)", in History of the Later Roman Empire, Dover Books , 1958. pp. 395, 397–398. ↑ Martindale, J.R. (1980). The Prosopography of the Later Roman Empire. Cambridge University Press. pp. 1073–74. ISBN 0-521-20159-4. ↑ Zeno had become allied in this occasion with Theoderic Amal, whose Goths had moved to attack the Empire. It has been suggested that Constantinople was defenceless during Zeno's siege because the magister militum Strabo had moved to the north to counter this menace. See Heather, Peter (May 1998). Goths. Blackwell Publishing. pp. 158–159. ISBN 0-631-20932-8. 1 2 3 Wolfram, Herwig (1979). History of the Goths (1990 reprint ed.). University of California Press. pp. 32, 270–276. ISBN 0-520-06983-8. ↑ Evagrius Scholasticus, Historia Ecclesiastica III. 14. ↑ Alexander A. Vasiliev, History of the Byzantine Empire, 324–1453, Volume 1, University of Wisconsin Press, 1958, ISBN 0-299-80925-0, pp. 107–109. ↑ Steven Runciman, Elizabeth Jeffreys, Byzantine style, religion and civilization: in honour of Sir Steven Runciman, Cambridge University Press, 2006, ISBN 0-521-83445-7, p. 400. ↑ J.B. Segal, Edessa, the Blessed City, Gorgias Press LLC, 2005, ISBN 1-59333-059-6, p. 95. ↑ Alan David Crown, The Samaritans, Mohr Siebeck, 1989, ISBN 3-16-145237-2, pp. 72–73. ↑ Cedrenus, I; Joannes Zonaras, 14.2.31–35. Cited in Whitby, ibidem. Michael Psellus, 68. 1 2 3 Austin, Roland G. "Zeno's Game of τάβλη", The Journal of Hellenic Studies 54:2, 1934. pp 202-205. ↑ Robert Charles Bell, Board and table games from many civilizations, Courier Dover Publications, 1979, ISBN 0-486-23855-5, pp. 33–35. ↑ James A. Parente, Religious drama and the humanist tradition: Christian theater in Germany and in the Netherlands, 1500–1680, BRILL, 1987, ISBN 90-04-08094-5, pp. 177–178. ↑ Frederick W. Norris, "Henotikon", in Encyclopedia of early Christianity, Everett Ferguson, Michael P. McHugh, Frederick W. Norris, Taylor & Francis, 1998, ISBN 0-8153-3319-6. Bruce Merry, Encyclopedia of modern Greek literature, Greenwood Publishing Group, 2004, ISBN 0-313-30813-6, p. 419.